Incredibly simple rules and limitless strategic variations… Qin. 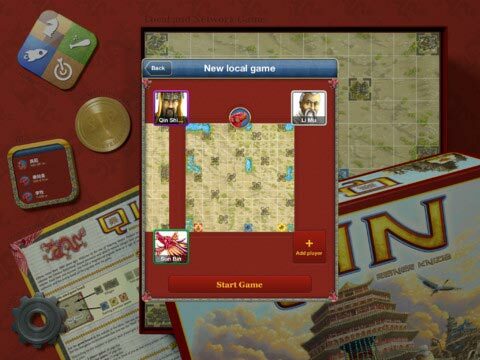 Qin is a strategy board game for 2-4 players featuring wonderful HD graphics and various levels of AI. 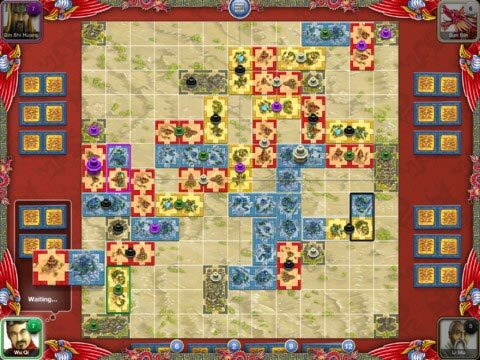 Conquer territories and villages by laying colored tiles on the board. Place your pagodas on top of the layered tiles. The player who builds his last pagoda first wins. Play against your Game Center friends on the Internet, face-to-face with a friend, gathered around an iPad, or solo with the game's built-in AI. 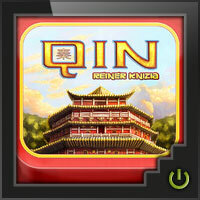 Today we are looking at the digital version of the tile laying game by Reiner Knizia called Qin (pronounced chin). For those of you who have not played the boardgame yet, here is a brief description of this deceptively simple and short game. The goal is to get rid of all your pagodas. Each player starts off with three tiles with two squares of one of three colors (think dominoes with color instead of dots to decide placement), and a certain number of pagodas depending on number of players. Each player must place one of his/her tiles next to a square on an existing colored tile. One you get two squares of the same color together, you get to place one of your pagodas on the “province”. Once you connect 5 of the same color, you can add a second pagoda and protect your province… and the two pagodas. You can also get rid of your pagodas by connecting to one of several villages. If you are the first one to the village, you can drop one in. However, your pagodas are not safe. If someone can get more adjacent pagodas next to the village… he/she can replace your pagoda. Provinces under 5 squares are not safe either. If someone with more squares connects to your same color…they can steal your province. This does make for some conflict. The iOS gameplay is the same. However, you can play against a pretty decent AI making it quite flexible. The game is very short, so it is the perfect game to play when you have 10 minutes to kill. The design is perfect with smooth controls. This is another fantastic digital version of a great little board game. I love this game, because even my six year old can play it. There is no text, only three colors to match, and simple win conditions. It is also over in 10 to 20 minutes… a rarity. I highly recommend this game to people who enjoy abstract games and/or need some good games to play with multiple ages. I think it could be an excellent gateway game, and will try it out with newbies. The digital version is going to make it easier to get some interested. If you don’t like abstracts, conflict, or any luck… do not get this game. You randomly draw three tiles, and not getting the right tile towards the end can be fatal. Hard feelings can occur when someone steals a village or province as well. If this does not bother you… download and try the game. It’s a steal. Add a Review for "Qin"